Used in the jewelry industry for hundreds of years, where it is known as a screw press, the fly press is becoming an increasingly popular tool for the blacksmith. This machine allows the smith to accomplish many operations on cold steel that could formerly only be done "hot". Obviously, this is a great advantage in increasing speed and precision in your work. 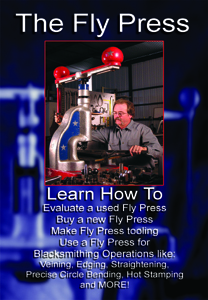 In "The Fly press", you will learn to evaluate used fly presses, what to look for in a new press, how to make tooling, and much more. John also demonstrates many common blacksmith operations on the fly press such as making tenons, veining, straightening stock, bending precise circles and hot stamping. All of these techniques are shown to you in the exceptional way that Love of Art Productions has come to be known for-clearly, up close, and easily understood. John Crouchet says, "if you're working cold you may be making money!" What a novel idea!